You bet. Wacktrap makes it easy to add any wack directly to your Facebook profile, shared alongside your regular Facebook posts. Or Wacktrap members can use Twitter to tweet that wack instantly. Just pick the wack you'd like to share and we'll take you where you need to go, in just clicks. The wack you've chosen will appear on Facebook instantly, so your Friends can view it and comment right away. To add that wack to Facebook, quickly, just choose the wack you want to share now. It can be your own wack, or anyone else’s. Make sure the wack’s expanded first, clicking 'Read More' if necessary, so you see the ‘Share’ feature found at the base of every wack. Mousing over the ‘Share’ feature, you’ll see the Facebook icon become available. Click on the Facebook icon and we'll take you to a brand-new page, so you won't be losin' track of that wack. If you’re already logged into Facebook, you won’t need to do it again from Wacktrap. If not, we’ll help you log into Facebook when you choose the icon from our ‘Share’ feature menu. We’ll take care of pluggin' in that wack link for you, so you won’t need to enter a thing. You'll see a spot, where you can add a Facebook comment of your own to appear alongside that wack you're sharing. The wack will post immediately to your Facebook page, shared with your personal Facebook Friends and appearing alongside your regular Facebook posts. Also tweet that wack via Twitter or follow Wacktrap on Twitter now. Want to share that wack on another site instead, like MySpace, Digg or your favorite social bookmarking site? Learn how to add that wack fast to over 150 top websites. Or share that wack with friends using our super-fast wack mail. No snail mail here. 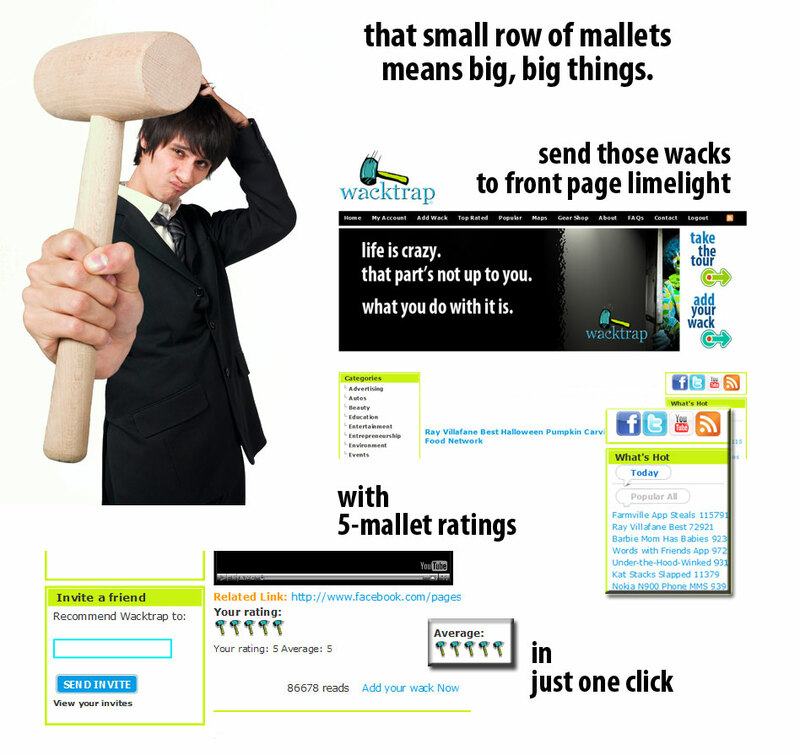 Do it all, directly from the Wacktrap site.